Pennsylvania businessman Aymer Vinoy Laughner purchased the site of the Renaissance Vinoy—overlooking Tampa Bay—in 1923 and commissioned architect Henry L. Taylor to design the Mediterranean Revival building. 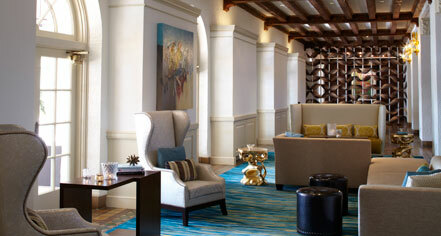 Two years and $3.5 million later, the 375-room Vinoy Park Hotel opened for business. During the early 1940s, the hotel was converted into a training facility for the Army Air Corps, and military cooks and bakers learned their trade here as well. 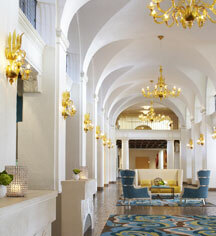 The Vinoy reopened as a hotel in 1945 and continued operations until 1974. The salmon-colored hotel underwent a $93-million restoration and expansion in 1992 that added a guest tower and complete recreational facilities, including an 18-hole golf course designed by Ron Garl. Today, The Vinoy Renaissance St. Petersburg Resort & Golf Club is still the only luxury resort on Florida’s west coast with a unique combination of a private marina, 18-hole golf course, tennis complex, spa, and historic charm.